Maldives – Travel Review. Angie Aspinall focuses on non-water activities at the Amari-Havodda resort, in the Gaafu Dhaalu Atoll. What is it like? To reach the chic Amari-Havodda resort, in the Gaafu Dhaalu Atoll, guests travel in style via a comfortable domestic flight from Male to Kaadedhdhoo airport, which is possibly the cutest airport in the world. Looking more like a single-storey school than an airport, this pristine building adjacent to the single runway is an introduction to the air of relaxation which permeates through the Maldives islands in the southern region of the Indian Ocean. From the airport, it’s a five-minute stroll to the shore and a short, comfortable boat ride to the island. Approaching the island by boat, it’s immediately apparent just how green and lush it is, with its tall palm trees swaying in the breeze. Handshakes on the jetty kickstart the guests’ holidays, swiftly followed by a welcome drink in the open-air reception area. Guests can experience beach-life in a sunset or a sunrise beach villa, or can opt for an over-water villa. The resort, established two years ago, is very well-resourced with a world-class spa, a gym, play centre, a multi-purpose sports pitch, medical centre and emergency shelter (in the event of a fire or a tsunami, like the one which struck the Maldives in 2004). There are also two shops, the Iru sunset bar, a pizza bar, and the Ember Robatayaki restaurant, specialising in Japanese cuisine. Next to reception, is the main Thari bar, which overlooks the resort’s infinity pool. 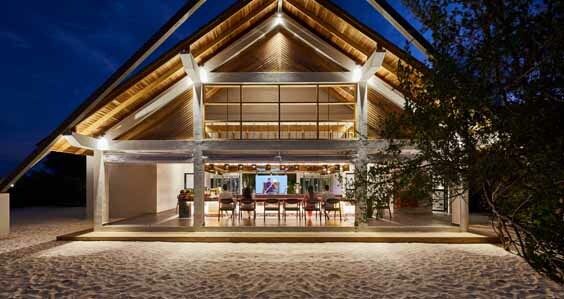 Next to this is the main Amaya Food Gallery – a restaurant without walls, cleverly designed so that wherever guests sit, they have a direct view of the beach and ocean. Barefoot dining is welcome here, and the atmosphere is relaxed (swimwear is not permitted but shorts and T-shirts are fine). The restaurant is designed to have an ‘Asian streetfood’ vibe and, whilst the food does have a focus to suit the tastes of the predominantly East Asian guests, there are always other tasty dishes on offer, ranging from Greek salad to pizza and Moroccan lamb to fish and chips. With so many non-swimming guests (the majority of Chinese guests don’t swim), the resort has a range of non-water-based activities for guests including cocktail-making classes, fruit-carving and ice-sculpture demonstrations. At Ember Robatayaki, guests can enjoy a private cookery class in either Italian or Japanese cookery. Learn the art of slicing sashimi and making sushi. And, if you ask Chef More nicely, he may even give you his recipe for Teriyaki sauce. Sunrise and sunset yoga classes are another popular pastime for non-swimmers in the Maldives and, at Amari-Havodda there are sessions three days a week. And a fully-equipped gym is at guests’ disposal. Snorkelling and diving lessons are also on offer and the ability to swim is not required for either. Full instruction is by PADI instructors. Possibly the most popular pastime for non-swimmers (besides taking selfies in one of the most iconic of holiday destinations) is enjoying a treatment in the Breeze Spa. With the origins of Breeze in Thailand, it’s easy to understand why this spa has such an excellent reputation. 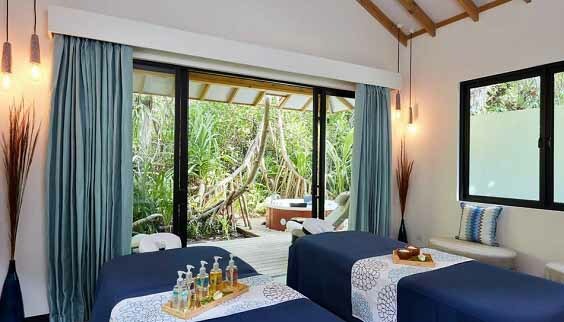 In direct contrast to the open, outward-looking design of the Amaya Food Gallery, the setting, towards the centre of the island is amidst tropical plants, giving each treatment room a verdant backdrop and total privacy. The earthy scent of the jungle-like vegetation mingles with the aromas of essential oils, creating a heady cocktail of aromas offering instant relaxation. The focus at Breeze is on each individual client. Pre-treatment consultations are in use not only to learn about any potential contraindications to treatment but also about how the client hopes to feel afterwards: relaxed, rejuvenated or energised. Couples experiences are on offer, including post-massage outdoor whirlpool bath experience, drinks and canapés, and even private dining on your private deck. And, if guests can’t wait until they get home before sharing their holiday experience with their friends, the resort has exceptionally good Wi-Fi enabling guests’ photos of this island paradise to be posted in the blink of an eye.